Margin. The very word speaks strongly. For any individual or organization to last, maintaining margin must be a priority. Here’s why – you will experience economic downturns. If financial margin has not been established, it can cause immediate financial issues and even jeopardize the solvency of the individual or organization. There are two types of margin every person or organization should have in place. Having money in the bank allows you to focus on your mission instead of exhausting yourself by determining the steps necessary to keep the doors open and the lights on. Financial reserves also allow you to ponder future opportunities to expand or grow your business or investments. Cash on hand also allows you the opportunity to encounter surprise expenses without worrying about how you will pay for them. In short, cash on hand allows you to sleep a lot better at night! This type of margin is created by managing your costs such that you are able to add money to the bank account each and every month. This is what happens when you have a profitable organization or life. This type of margin allows you to know that current bills will be paid without having to erode financial reserves and to also fund future dreams! If I were to have a choice of one type of margin, I would choose #2 – Monthly Savings because I would be able to immediately begin funding #1 with the surplus profits! Where are YOU personally when compared to this goals? Where is YOUR ORGANIZATION in relation to these goals? 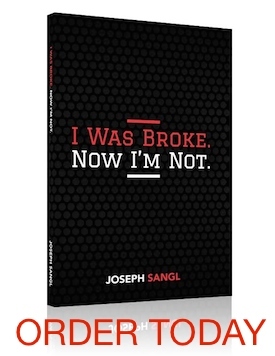 In my book, I Was Broke. Now I’m Not., I share three things every person should save for and HOW to achieve it. You can purchase HERE or acquire a Kindle Version HERE. We are finding this to be so true! We are in the midst of a “UEE” (unexpected economic event) to the tune of about $900 a month for the foreseeable future that would have crippled us a year ago. Now, we are able to weather the storm due to having both of these types of margins. It is slowing down on some of our other financial goals and causing us to say no to some fun extras, but margin turns what would have been a crisis into an inconvenience. Thanks for waiving the banner, Joe! And by waiving the banner, I mean waving the banner. I hate it when that happens!